Simplifying a photograph by making it in black and white allows you to create a completely different photograph, and it’s really fun. Crafting your black and whites requires that you take control of the color. Colors converted to black and white are represented by tones–shades of black, white, and grey–and you can control these tones by altering the way the colors are interpreted. Let me show you how using colored filters lets you maximize the black and white tones in your photos. I’ll use On1’s brand new Photo RAW 2018 for this demonstration. Get a free trial copy–click here. 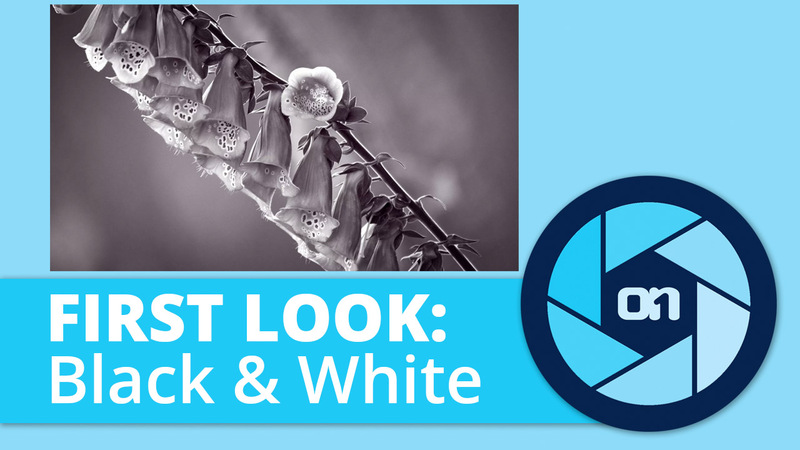 White balance is a most basic component of your black and white photos. Since we’re going to adjust the tones of the picture based on the colors, and white balance adjusts the colors, it’s important to get the right white balance. These foxgloves were in the shade when I photographed them, but I had been photographing the opposite hillside and didn’t change the white balance from daylight to shade. The blue sky is illuminating the flowers and you can see that the picture is very blue overall. As a result, it won’t have a variety of colors for a variety of tones. In Develop, I chose the Shade white balance preset and it restored all the colors to the scene. Color filters are not adding a color to a black and white picture. Instead, think of them as a glass filter you put in front of the lens, which is what you would do if you were using black and white film. They’re called ‘filters’ because they simplify the colors to tones. Tones similar to the color of the filter are brighter, and colors opposite the filter become dark. If you use a yellow filter on a sunflower in front of a blue sky, the black and white picture will have a white flower in front of a very dark sky. Start by clicking into Effects and add a filter. I added the black and white filter and tried the preset color filters first, but the color slider pushed over into the purple range gave the flowers the tones I was after. Moving this slider you can manipulate the look of the whole picture based on the original colors of the picture. Black and white really isn’t the correct term for this kind of photo. Monochrome is more precise because you can tint the picture (add colors to the tones) and it’s no longer black and white, but it’s still monochrome–which literally means ‘one color’: shades of grey. Using split toning you can create familiar tones like sepia (brown) or a look like a cyanotype (blue). Think of split toning like this: you’ve got ink and you’ve got paper and those two can have colors. Black ink on white paper makes a black and white picture. If you tint the ink and the paper a little brown, you get sepia. But you can also tint the paper one color and the ink a different color (that’s why it’s called Split Toning) and it’s a lot of fun with endless possibilities. Tinting the highlights is like tinting the paper, and tinting the shadows is like tinting the ink. These tints can affect the mood of your photographs. In this case, I chose a tint reminiscent of the original magenta of the foxgloves flowers; maybe that will help it look like a picture of purple flowers. Anyhow, I like the color. You can add as many filters as you like in Photo RAW 2018. Adding the Tone Enhancer will let you give a little more punch to your highlights and shadows. One thing to consider when adjusting these is that it is ok to crush the blacks and blow out the highlights. Monochrome pictures often have areas of total white or complete black which could be distracting in color. Press the J key to see which areas are blown. Red means it’s a blown highlight and blue is for crushed blacks. You should crop for impact and for output. In this case, I knew my picture needed to be 16:9 to fit on this blog. Wherever you need to share your photograph, enter the dimensions and then crop for the most impact on your subject. I made sure the one flower is in a prominent position. In color pictures, a shadow darkening the edges of the frame can be very obvious and draw attention to itself. But in black and white, a vignette is usually much less obvious and can do a great job of highlighting the subject. Photo RAW’s vignette filter is quite good, and you can even put the vignette on its own layer so that you could blend it manually with a local adjustment brush or eraser. It’s a good idea to create the vignette and then come back to the photo a little later with fresh eyes to make sure you haven’t gone overboard. Making black and white photographs is a way to see the world and your pictures with a fresh perspective. Any good color photo can be a good black and white, and getting the colors into the right starting spot will affect the tones of your black and white more than anything else. You can alter the tones with color filters in many applications like I did here in Photo RAW 2018, and you can even do it in your camera when you make the picture (here’s an article about that). This works on all types of photos from landscapes to portraits. Get going and see which of your favorite color photos will now become your favorite black and whites.